The Linssen Variotop® is a striking example of Linssen's in-house developments and is without a doubt one of the technical milestones in modern yacht building. The Linssen-Variotop® is therefore a symbol of the innovative power of Linssen Yachts and has been patented in a number of countries. A yacht equipped with a Linssen Variotop® is actually a very special combination of an inside and outside helmsman’s position and a fly-bridge. With a Variotop® you are sailing “outside” and you can combine the aft deck or open cockpit with the wheelhouse to form one big external space. If the weather gods are less well disposed towards you, just close the Variotop®, and you will actually be connecting the helmsman's position to the aft cabin, creating an impressive internal space. In this way the Variotop® unites the compartments and therefore the crew. The Variotop® is a folding roof that covers the wheelhouse so that it is completely watertight and insulated thanks to ingenious locking and sealing systems. Close the Variotop® and the wheelhouse doors and the open helmsman's position is instantly transformed into a heated Variotop® wheelhouse where it is a pleasure to be. On a warm summer’s day, just cruising along, the boat gently rolling at anchor or leisurely moored to the quay, the Variotop® – now like a fully fledged bimini top – provides wonderful cool shade. the thrust handle is in a safe place and positioned ergonomically. 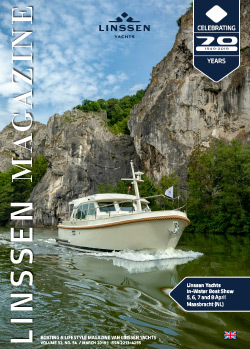 That is the Linssen Variotop®!